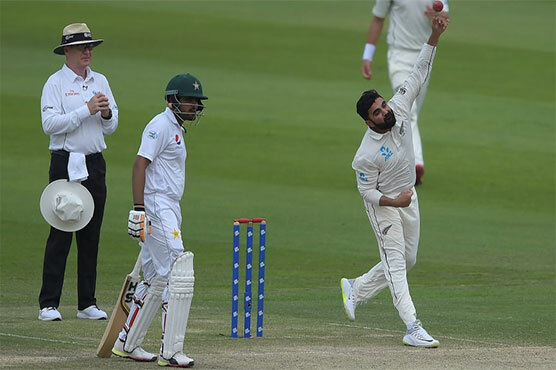 ABU DHABI: Debutant spinner Ajaz Patel took five wickets to lead a never-say-die approach from New Zealand bowlers as they pulled off a thrilling four-run win over an indisciplined Pakistan in the first Test in Abu Dhabi on Monday. In the pantheon of infamous Pakistan implosions, this must rank right around the top. Pakistan were cantering to a victory around lunchtime, courtesy Asad Shafiq and Azhar Ali, and the wicket of Shafiq off the last ball before lunch seemed no more than an inconsequential irritant. But New Zealand, blindly, illogically, unreasonably, refused to write off this match as a lost cause, compelling Pakistan to believe the game was still on, the pressure all theirs to bear. And somewhere along the line in the middle session, Pakistan were convinced. New Zealand had won that game of poker, and, in the process, set the wheels in motion for a four-run victory, their narrowest Test win in history, and surely one of their most gratifying ones. After lunch, Babar Azam lost his head and ran for a single his partner was least interested in, and just like that the panic set in. Sarfraz Ahmed, woefully short of confidence, edged a sweep – a shot that once was a strength but now appears to be a crutch. The tail was in, and the shots they played soon turned the panic into complete hysteria. Even as Pakistan lost their heads, New Zealand kept theirs. Azhar Ali was running out of partners without quite having the belief to take the game into his own hands, and he tried to inch Pakistan to victory with No. 11 Mohammad Abbas in tow. But, having blown their chance to waltz through the door, Pakistan soon found the back door slammed shut too by a New Zealand side playing their first Test cricket in over seven months. New Zealand’s indomitable spirit played a massive part in how they sneaked home in one of the most unlikely comebacks of all time, but the inquisition from Pakistan is destined to be punitive. There was so much to take issue with in the approach to the target, a small target by lunch. These were professional cricketers and with the finishing line almost reaching out in embrace, they forgot how to run. Strategies were thrown out of the window, composure tossed aside in the frenzy. Babar and Sarfraz may be the most disappointed in the manner of their dismissals, but the lower order could have few excuses too. Bilal Asif tried to swing Patel into Dubai with an ugly hoick, with Azhar Ali at the other end, handing New Zealand the seventh wicket as the possibility of defeat became a probability for the first time. Azhar, too, was guilty of sensing the moment far too late, only properly farming the strike when he was with Abbas. Hasan Ali may receive the brunt of the blame; Pakistan cricket does like a scapegoat or two. He was the one who decided to go into T20 mode, hoicking Patel to deep midwicket with his side needing 12 runs. For New Zealand, Patel was the hero and such team spirit exists in their dressing room that it barely registered he had completed a five-wicket haul on debut, when he trapped Azhar Ali in front for the final wicket. It was a compliment to the debutant that he was the man, Williamson trusted to spin the side to victory even when Ish Sodhi was in the side, and Patel repaid that in bucketloads. He had Pakistan’s batsmen on a piece of string by the end, and cut the cord just in time to prevent them scrambling their way to safety. Things had looked so different at lunch. 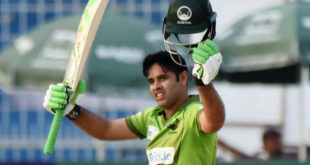 Azhar and Shafiq had belatedly appeared to step into the boots of Misbah-ul-Haq and Younis Khan, an 82-run partnership putting Pakistan within touching distance of a 1-0 lead in this series. Coming together with Pakistan at 48-3, they had sucked the life out of New Zealand’s hopes. Patel had triggered Pakistan’s slide with a lovely offbreak that came back in and hit the pads quicker than Imam-ul-Haq could cope with, before Sodhi made his impact on the game. A flighted delivery beat M Hafeez in the air, leaving him spooning a catch to short cover, while Haris Sohail – much as he had first innings, scooped drove a low full toss in the air. Sodhi completed a brilliant, low catch, and the famed Pakistan implosion never far away from the surface came bubbling to the fore once more. But then, Azhar and Shafiq joined hands. Azhar was never rash, but insisted on keeping the runs flowing, eager to play the supporting role to Shafiq who looked so free from pressure you wondered if he really understood the importance of the situation. Sodhi suddenly lost his rhythm and couldn’t pitch two consecutive deliveries in the same postcode.